A full response to the first Presidential Debate is reported in this article. Just because it is a bar of soap, does not mean it is necessarily clean. 5 Million Private-Sector Jobs in past 30 months. America Does Best When the Middle Class Does Best. The debate opened with Obama claiming to have created 5 million jobs in the last 30 months. While that number may be roughly correct (perhaps more like 4.5 million) a more complete view of the situation is that the number of jobs created since February 2009 (after his first full month in office) is less than 1 million. The Net job gain in the US since he took the oath of office four years ago, is a mere 125,000 jobs. Obama took over during the height of a recession, after the financial meltdown and when many believed the worse to already be behind them. Four years later, there are barely 125,000 more jobs. The 2010 Census states that just the natural population growth of working adults is about 1 million jobs per year. So a growth rate of 4 million jobs during Obama’s term would have only taken care of natural growth, and not decreased unemployment at all. Instead there has a been a net total gain of only 125,000 (as of last figures). This is why the unemployment rate has been and remains consistently high during the whole of Obama’s term. President Bush started his term with the “Dot Com” recession that began under Clinton and was soon hit by the September 11 attacks. Unemployment hit 6% before his management and quick actions led to an economic expansion that lasted most of his two terms and quickly lowered unemployment. For most Bush’s second term, unemployment was consistently low in the 4% range. As the sub-prime mortgage crisis spread to a full blown financial meltdown near the end of Bush’s term, unemployment began to rise. When Obama, the media and the entire Democratic party yelled that the situation Bush had created was unbearable, the unemployment stood at around 6%. By the time Obama was elected, it had risen to 6.5% (though he did not know it yet). By the time Bush’s term ended, it stood at 7.3%, a number Obama would dream of right now. The final months of Bush’s term, once Obama was the president-elect are also of debatable responsibility since the “lame-duck” President cannot do much and the market already is in full anticipation of the plans the next President will enact. In any case, under Obama, the unemployment swung up wildly reaching a shocking 10%. It has remained consistently high throughout his entire term only recently falling to the low 8% range. As far as the last 30 months, some jobs have been created, still short of recovery speed growth, but to tell the whole story requires qualifying the jobs. The majority of the vanishing jobs during Obama’s tenure have been high paying jobs, and the overwhelming majority of the created jobs these past 30 months have been low paying jobs. In essence, this means that though mid-wage and higher-wage jobs lost during the recession made up about 80% of the total jobs lost, they have only made up about 40% of the recovery growth. This means that on top of the fact that the Obama “recovery” does not even cover natural growth, much less actual recovery jobs, those that were created are largely (nearly 60%) low-paying jobs. The complete outlook is therefore a disaster. People have in great part given up looking for jobs, while others, acknowledging the realities have accepted low paying jobs such as food service, cashiers and freight carrying jobs. How is it then that the unemployed rate has come down somewhat from Obama’s high of 10% to today’s 8% range? Unemployment figures only count those who are actively looking for jobs and many people in the US today simply gave up. This artificially lowers the unemployment rate but does not change the reality that those people do not have incomes, and largely are not productive. That is why the bottom line is that when Obama took over, there was only 125,000 less jobs in the US while in the midst of a massive recession, when 1 million net workers a year enter the labor force. Furthermore, several million mid-wage and high-wage jobs have have been “swapped” for low-wage jobs. Manufacturing, technology, higher services remain dying while Americans eek out a living on a low-end service jobs selling pizza to each other, while a few in the corporate and financial classes make large fortunes while producing little if any value. That is a more complete picture of Obama’s 5 million jobs that Romney may want to clear up next debate. So while 23 million may correctly describe the number of people who are struggling in the job market, it would have been clearer – and more accurate – to say that’s the total unemployed and underemployed. Part-time Workers working part-time not by choice, and unable to find full time work. “Marginally Attached” to the labor market. This group includes the people who stopped looking for work; basically for the time being have given up. This 23 million number definitely does not include people who have taken a pay cut as CNN states. Rather than being incorrect, it more accurately portrays how the official unemployment number “touted” by Obama of about 8% does not at all show the real situation on the ground. Though this issue is not exactly one to be fact checked, it is of note. Obama repeated these theme continuously throughout the debate and Romney unfortunately harped it back sometimes. It is little more than class warfare and an attempt at bribing the voter. The “Middle class” is vague enough that the vast majority of Americans believe themselves to be part of it. Those at either extreme of it would be surprised to find the other considering themselves part of the same class. Most Americans who have incomes and any type of home, rented or purchased are likely to believe themselves middle class. Likewise people with quite a bit of wealth as long as it is short of “millionaire” status also consider themselves the middle class. There are relatively very few voters who consider themselves poor, and very few who consider themselves rich. So therefore, it is a cheap trick to try to pander to the middle class at the expense of all others in an attempt to make the voter feel uniquely supported by that candidate. It is insulting to hear how the rich and poor are ignored and neglected. The rich specifically, existing only as reservoirs of wealth that is to be seized at will to help not the poor mind you, but the middle class. A US president should reject such talk, and should be adamant that he represents all Americans, rich or poor, and that “America does best, when all Americans do best” Mr. Obama. A president should wish to protect the liberty and freedom of all Americans, and foster the economy to the benefit of all those who wish to participate in it, and do its very best to seize as little as is possible from their earnings and property. The truth is that the poor do best when the rich do best, and when the middle class does best, a roaring economy where jobs are plentiful, and profits are available to those who risk their capital is the environment where all do best. The pandering to the largest class is nothing less than sickening. No less so than pandering to either the rich or poor would be, though that would be unheard of since they are a minority of voters. The third area: energy. Energy is critical, and the president pointed out correctly that production of oil and gas in the U.S. is up. But not due to his policies. In spite of his policies. Mr. President, all of the increase in natural gas and oil has happened on private land, not on government land. On government land, your administration has cut the number of permits and license in half. This either a blatant lie or an amazing lack of logic. Just because new permits and licenses have been granted does not mean federal lands have brought more gas and oil. Obviously, there are many factors at play, including leases that expire, drilling and extraction regulations, and wells that decrease in output or dry up. If you decrease the rate of new permits and licensing, it is quite possible to decrease the total output. So how about we check the facts CNN, instead of relying on your less than brilliant “by definition”. Ironically, the very same document by the IER that CNN quotes as a source, completely disagrees with that very statement, among others that CNN makes. 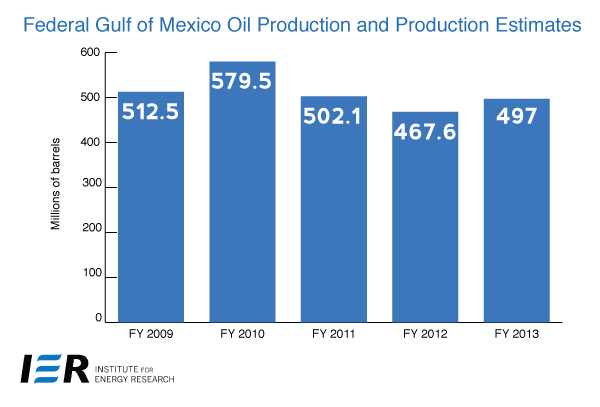 No need to delve into detail here, the document features a nice graph of Federal Gulf Oil Production. It features it as indicative of all federal production because 80% of all oil output on federal lands is offshore, and 95% of that is in the gulf. While Oil output peaked in the Gulf by 2010 as policies and leases put into place during the Bush administration came into play, Obama’s policies kicked in and dropped output in 2011 and 2012. As can be seen, oil output on federal lands is lower than it was in Obama’s first year office at 512.5 million barrels. According to this graph, it peaked in 2011 at 579.5 (quite arguably from leasing, policies and permits enacted during the Bush years), and has since fallen. The 2013 estimate is in fact an estimate, and still remains below the 2009, 2010 and 2011 figure. However it is of note that the paper sites the US EIA here as a source for the date. When we take a look at it however, the data indicates a slightly different graph. Though it agrees that outputs fell sharply in 2011 and 2012 (and will come back a bit in 2013), the EIA information shows that 2009 was the highest production year, and it has decreased ever since as opposed to the 2011 peak the IER portrays. This indicates an even poorer Obama era performance. So while it is true that domestic production in total is up due to private and state drilling (in states like North Dakota whose output is booming), Mitt Romney was dead on in saying that the increases are in private and state lands. Where Obama is in charge, in Federal lands, output is down considerably since he took office. CNN’s misleading claim that output is still higher because “by definition” he gave some leases and permits is dead wrong. Obtaining the direct data from the sources, still shows the Obama era decline without the 2011 spike shown by EIA. To be fair, oil output is extremely complex, and trying to pinpoint what increase or decrease can be attributed to which president is not a simple (if even possible) matter. There are hundreds of factors at play, and the projects involved are long-term projects. There is also arguably less oil in the ground every day as it is pumped out. On the other hand, innovation, technology and oil prices actually also change the calculable reserves as more or less oil becomes recoverable (oil sands, shale oil, etc). 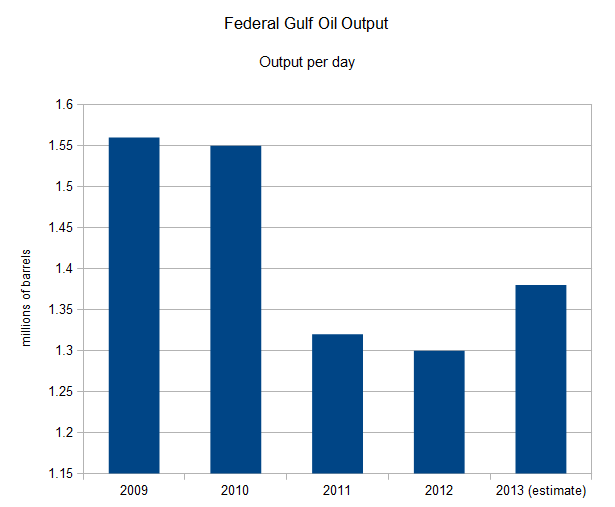 With this in mind, it is more accurate to see that since Bush took over at the turn of the century, there was a significant increase in Federal Gulf output to a the peak range of 1.55 million barrel per day throughout his first and second terms. These levels have never been surpassed since. Starting in 2005, output dropped sharply in large part due to Hurricane Katrina which shattered oil production installations and infrastructure throughout the Gulf region. From that point on, there began a period of repair and steady increase throughout Bush’s second term which continued into Obama’s early period and peaked in 2009 (or 2010 if the IER is to be believed instead). They have dropped ever since under Obama’s watch. These 2009 and 2010 levels reached the pre-Katrina Bush levels of production. A good argument can be made that this was mainly due to Bush era policies and from 2009 or 2010 onward we see a decline based more on Obama policies. As can be seen in the graph, Alaskan production which has dropped drastically ever since its peak in 1988 actually held steady for the longest period since 1988 during Bush’s first term. It then continued a slow decrease which has sharply accelerated under Obama’s term. It is just as Romney pointed out, oil in the lower 48 on private and state lands that have increased production IN SPITE and not because of Obama’s policies. The total domestic production line undoubtedly shows production way up, due the increase on private and state lands, and it is this increase that Obama attempted to take credit for. decreases due to Katrina and then Obama policies are clearly seen.. as is the large private land and state land increase in output while there has been decreases in Federal Output. To be thorough, Obama had a disaster of his own which helped to decrease his term’s output; the BP Horizon disaster. However, while the natural disaster under Bush was exactly that, and affected huge areas of the gulf and destroyed billions of dollars in infrastructure and capacity, Obama’s output drop was caused by policy. Firstly, the accident itself happened under his regulatory watch, and secondly, the source of the drop in output is due to his response which was a 6 month moratorium on drilling in the gulf. Furthermore though the ban was lifted in October 2011, by February 2011 no one had yet received a new drilling permit, which in effect amounted to a 10 month ban. Despite the one-year drop in production, oil production on federal and Indian lands from 2009 through 2011 totaled 2.027 million barrels. That’s an average of 675,000 barrels per year during Obama’s term, compared to an average annual production of 609,000 barrels annually during Bush’s last term. Those numbers are so incorrect it is difficult to even decipher what they are talking about. As can be seen, oil output in the US is measured in millions of barrels per day! 600,000 barrels a year is quite minuscule The error though, is not simply an omission of “per day” or some zeroes… I was unable to figure out what in the world that is at all. A first guess would be that they are averaging Obama’s best oil producing years, 2009 and 2010 as discussed above, and comparing those with Bush’s worse years following the Katrina Hurricane, and misleadingly implying that this reflects the true picture of an 8 year period, plus hiding the last two-year sharp decline of production under Obama. However, it was not possible to reconcile their numbers in any such way, even ignoring the gross error in magnitude. Talk about fact checking the fact checks. However, we will leave this aside in fairness due to the admitted complexity of deriving these conclusions and actually look at what each administration DID in terms of oil production. While total output is a result of hundreds if not thousands of variables from the past and present, viewing an administration’s actions is much simpler. They quite directly either increase production or decrease it, even if the effects will not be seen for years in the future. First, let us take a look at the number of leases, permits and acres granted for production under Obama compared to those under the Bush administration. No need to look any further than the very document CNN sites to claim the very opposite conclusions. The study derives its information primarily from Obama Administration websites, and from the Bureau of Land Management, the Bureau of Ocean Energy Management and other Department of Interior websites. It reports the following conclusions in two parts, federal policies and performance for Federal Onshore Lands, and those for Offshore Waters. To bold fonts are my additions. In light of these facts, Romney’s claim that under Obama licenses have been “cut in half” is actually generous. There are 99% declines in leasing revenues, 62% declines in permitting, 66% declines in offshore acres and tracts, and a shocking new offshore lease plan extending to 2017 which would be the lowest since the process began in 1980. Any attempt there by CNN to bring in these numbers to significantly under “half” to accuse Romney of stretching the facts is precisely guilty of that accusation. Yet the actual numbers of permits and licenses haven’t been “cut … in half.” As mentioned above (and including data from part of the Bush administration), there has been a 42% decrease in leases and 37% decrease in drilling permits — not 50%, as Romney implied. CNN is again cherry picking numbers to attempt to get at a lower than 50% target, and barely being able to do so. It basically ignored offshore federal permits where the drop under Obama is far more significant and focused on the types, years and areas where the decrease was less (and still quite substantial). The omission is more glaring since offshore federal production is more than 80% of the total federal production. As a reading of IER’s study points out (from data provided by government websites), Romney’s statement is actually quite generous at the 50% mark. Finally, there are other regulatory changes that Obama’s administration has done to discourage development, though the effects may not be felt until later. BP, after the 20 billion dollar shakedown and thrashing it received from the administration after the BP Horizon (this is in addition to damages and repair it immediately took upon itself to pay, and in addition to the fact these should be paid out of a fund the government collects from all oil companies including BP since the Exxon Valdez spill for precisely such disasters) cancelled its Liberty Oil Field project in Alaska. Alaska’s state land production has been in sharp decline since its peak in 1988 (except for most of the Bush years), and the state was eagerly expecting this expansion on Federal lands in order to keep its pipeline infrastructure profitable. BP quickly realized that working under an Obama administration was not preferable. Other such projects have been cancelled directly or indirectly by the Obama administration such as the Keystone pipeline. In conclusion, the Obama administration has clearly been an anti-oil administration and his attempts to claim credit for increased production in areas he held no or little control is misleading. Romney’s correction of this issue was not only right on, but also a great example of a “Fact Check” done live during the debate without turning to advisers, pundits and spin-doctors afterwards. throughout the debate despite Romney repeatedly telling him this was not part of his plan. Obama also referred to it as not only a tax cut, but one benefiting the rich only. Romney said he would offset that by closing loopholes and reducing reductions,” he said. “So if you take him at his word, our verdict [on Obama’s claim] that Mitt Romney would cut taxes on the wealthy by $5 trillion, the verdict is false. Others have tried to find some sketchy support for Obama’s claim, but all have to include in their numbers the Bush tax cuts to even attempt this. Obama specifically said that these were separate from the Bush tax cuts, which helped him arrive at his $8 trillion figure. Barak claimed that Romney’s plan aimed to throw an additional $2 trillion at the military that they did not even ask for. Romney did not seem to adress this point too much as he focused on other Obama claims. Romney did however say several times he wishes to strengthen the military and maintain America’s military superiority. One could safely assume, this likely includes increased spending (though not necessarily). As much as I want to give Obama credit for a truthful statement here, it is still impossible to do so. Romney’s campaign has stated they wish to see defense spending at about a 4% of GDP level. Currently, it is at 3.5% which is far below historic levels and most definitely below wartime levels (even 4% would be below both those levels). Some have estimated that raising the spending to 4% would cost an addition 2.1 trillion dollars in the next 10 years. Therefore, right off the bat, throwing a $2 trillion figure out there, along with a fictitious $5 trillion tax cut and another trillion from the Bush tax cuts (which are already in effect) in order to get to imply an immediate $8 trillion deficit in Romney’s plan is highly inaccurate and misleading. I believe that we need to have a broad public discussion about what we should spend on defense. I’ve been very clear about my belief that a 4 percent floor, a 4 percent of GDP floor is really that, and I am concerned and I — this comes from my evolution as a service chief, where we worked very hard to efficiently and effectively invest for the future, and in that development, I’ve gotten to a point where I think — I really do believe — this 4 percent floor is important. And it’s — and it’s really important, given the world we’re living in, given the threats that we see out there, the risks that are, in fact, global, not just in the Middle East, and that we as a nation need to be very careful about how we’re going to invest in defense in order to handle these kinds of challenges which are going to — while will persist for the foreseeable future. Sorry Obama, even when Romney himself freely admits that he wants to strengthen the military and not cut it, you still have to lower yourself to lies and massive exaggerations. Obama’s tirade of lies on top of his poor performance continued next (skipping quite a few mind you) by claiming that according to Romney, Donald Trump would be a small business, and thus entitled to lower rates. I am sure Trump was delighted to be mentioned in the debates, and by Obama’s dry attempt at humor. While Romney’s plan does not define who is or is not a small business, some of Donald Trump’s companies would qualify as a small business because they have fewer than 500 employees. Firstly, the talk of tax cuts and income is completely irrelevant here to the question at hand. Furthermore since you have a system where the wealthy pay the vast majority of federal taxes, you cannot avoid that when taxes are cut, the vast majority of this “cut” goes to them as well. You can only cut taxes for those who pay it. It does not follow however that the tax cut is somehow specifically engineered to benefit the wealthy, it is quite usually the opposite. IF you already pay 0 federal taxes, no tax cut will further cut your taxes, and if you pay taxes, tax cuts will benefit you. See more about that here. In any event, to the question at hand, CNN again wildly skews the truth. As their own page admits, Romney’s plan does not define what a small business is because the federal code already does so: a business that employs less than 500 people. End of story. The Donald Trump Organization (and not the sum of all his companies), they are forced to admit, employees 22,000 people. Just misses the HIGHEST limit on small business by a factor of 4,400%! For CNN, this apparently means Obama was right on the mark. Of course most small businesses do not have anywhere close to 500 employees, many have just a couple, but you have to draw the line somewhere and the line has been drawn at 500. CNN attempts to make this “slight” adjustment in Obama’s favor by pointing out that not ALL of Trump’s companies have over 500 employees. Donald Trump as can be expected, owns or has shares in many companies. It can be assumed that what CNN is trying to imply is that Trump would unfairly benefit as a small business since he owns some. That is so absurd that it is hard to know what to make of it. Yes, a small business is a small business… if Donald Trump buys a candy store with one employee should it be called a global conglomerate because Donald Trump owns it? What if Donald Trump buys a Volkswagen, should the federal government consider it a Lamborghini because he owns it? What if he buys 20% or 1% or one measly share of a publicly traded small business? Should it now be considered a megacompany because Trump owns a part? Should the other partners and shareholders suffer due to this regardless of their poverty or wealth? Now, more to the point… just because business is considered what it is, either small business or not, does not mean that a wealthy individual derives any unfair benefit from that fact. A small business can elect to be taxed as a corporation or as an individual (a pass through entity) . Obama’s entire point was to attack Romney’s effort to lower individual tax rates that will in effect lower the tax rates of many businesses that are taxed as individuals. Obama only favors lowering the Corporate tax rate (now, though he never tried to do so before). Obama’s useless point was that some of these individuals may be very rich. Well, when you are taxed as an individual, all the income of all your companies “pass through” to you and you still pay the rate you pay in any event. So even if Trump owns a candy store that makes $10 a year, he will be taxed a high income tax rate based on his total income (from his other companies) on those ten dollars. Nothing in Romney’s plan would help him there. In the other scenario, where the small business is an entity in itself, namely a corporation that is taxed as one, then it is taxed as one as it should be, at the Corporate rate. Both Obama and Romney said (though it is hard to believe Obama) they wish to lower the Corporate rate. If the Corporation chooses to pass on income as dividends and/or capital gains, then the individual owners (be they Trump or not) will pay taxes according to those set of rules AFTER the profits were already taxed at the Corporate level. So the accusation that Romney’s plan somehow considers someone as large and as wealthy as Donald Trump a small business is a flat out lie. The further implication that his plan will somehow unfairly benefit those individuals is also false. It is true, that all small businesses themselves will be benefit from lower rates, and thus be able to become more competitive (and benefit the consumer).All owners of the small business may benefit from that general effect, as will the entire country, but no high income individual will be able to avoid his tax bracket as Obama implies under Romney’s plan. CNN’s Fact Check on this issue is a dismal fail. Mitt Romney defended the importance to helping all small business, including the top 3% of earners because they actually employed half of all the small business employees which in turn are a quarter of total US jobs. This top 3% would be hurt (and hence the jobs they create) by the Obama plan. The 3% of firms figure is not disputed by either candidate. The point is that while Obama is trying to point out that it is a very small figure, Romney is pointing out that it is misleading since large amounts of small business firms have little or no activity, and employ no one. For various reasons, lots of individuals can be considered small businesses in some ways (from part time free-lance translator to hair dressers). It is the larger small businesses that employ the great majority of the workers in small business. The staff of the Joint Committee on Taxation estimates that in 2011 just under 750,000 taxpayers with net positive business income (3 percent of all taxpayers with net positive business income) will have marginal rates of 36 or 39.6 percent under the President’s proposal, and that 50 percent of the approximately $1 trillion of aggregate net positive business income will be reported on returns that have a marginal rate of 36 or 39.6 percent. So in fact, while Obama is raising rates on only 3% of small business, he is raising rates on half the small business income. Back to the debate, Obama replied by mocking Romney and saying that Romney would consider Donald Trump a small business. We have already debunked that above, but what about the top 3% claim? It is difficult to pinpoint exactly, but the general pattern certainly seems to hold true. The US Census Bureau provides the following charts which show this general pattern. While the exact stats cannot easily be derived, it is seen that the largest two brackets of small businesses (those that employ between 20 and 499) people employ about 40 million people and TWO THIRDS of all employees working in small business. The number of firms that make up these two highest brackets, 620,977 (for 2007) are actually only 10.3% of employer small businesses and a tiny 2.2% of all small business, and they do in fact employ two thirds of the workers. Taken at face value, it means that Romney’s point is actually right on target, if not quite conservative. However, it must be noted that while there must be some correlation between the number of employees and total profits, they are not the same thing. The correlation between size and total receipts is almost total as can be seen by the same chart, but total receipts (total sales, revenue etc) is also not the same as net profit (though related). Some businesses may earn high profits with few employees and some earn few profits with many employees. Romney also did not specifically define what he meant by the top 3% of businesses, be they the top by employment figures, by earnings or a different measure. However, given that a small business is defined by the number of workers it employs (fewer than 500) and not any other measure, Romney’s remarks seem to be on the ball, though we were not able to fully verify (nor discredit) them. The pattern is definitely clear… out of nearly 6 million small businesses (that actively employ) and 27 million total small businesses, it is the largest 109 thousand (only 10.3% and 2.2% respectively) that create two thirds of the jobs in the small business world. Further support can be found here by the SBA. Their charts indicate that in 2007, the highest bracket of earners among small business, 1.421 million firms earning Incomes between $1,000,000 and $10,000,000 paid $673 billion in wages (71%) out of a total $945 billion in wages paid by small business. Again, this indicates that the top 5% of earners among small business pay 71% of the wages in the small business world. This is right in line with Romney’s claim that 3% represent half of the jobs. Though it proves rather difficult to try to pinpoint his exact claim on the 3% figure by numbers publicly available, it is no question that his point is very valid and most likely in the correct range. Obama’s plan to “only” raise taxes on the top 3% of small business sounds misleadingly small as it has a hugely disproportionate effect on those firms that create jobs in America. Tax policy that ignores them, as Romney warns, would definitely be unwise if not just immoral. This issue has more complexity to it, and a more in depth attempt at precision is related in this follow-up article. This issue will undoubtedly be repeated in the second debate after both candidates and their teams have perused fact checks and counterarguments. Romney needs to be well informed on this issue or stands to lose an argument in which he is essentially correct. I’ve proposed a specific $4 trillion deficit reduction plan. … The way we do it is $2.50 for every cut, we ask for $1 in additional revenue. Pure fallacy, and most of the mainstream media actually called this one correctly. Obama’s savings come mostly from tax increase, and not the other way around. He counts as savings, a trillion dollar in cuts already negotiated with Republicans in the legislature, and savings from the wars that are ending anyways. His plan has no real cuts (other than the Medicare cuts that are unpopular and Romney spelled out, and they only go a small part in paying for Obama care, not to decrease the deficit). Obama admitted that premiums have gone up under his watch and Obamacare, but at a slower rate than anytime in the past 50 years. This is a flat out lie. While overall health care spending has gone up relatively slowly, premiums have gone up very rapidly. This in fact shows that Obaamcare has a very negative effect on premiums even while health care costs are not going up. Romney pointed that premiums have gone up by about $2,500 per family since Obama took office, and he is on the mark. In 2011, premiums rose by a striking 9%, followed by a 4% increase this year. The above was Romney’s claim against Obama. It is simply correct, and there is no way around it. What did the main Fact Check providers did was simply ignore the claim. FactCheck dot Org goes as far as including the claim as part another statement, claiming it false, and then ignoring the food stamp portion. I was hoping to use your notes to support Romney’s claim. But it appears you’ve misread the 20-99 and 100-499 lines in the firm’s employee’s numbers to arrive at the 100-499 and 500 or more. Instead of 108,855, I get 532,391+88,586 = 620,977 or 11.4% of small businesses employing roughly 2/3 of the workers. Thank you very muhch for pointing out the miscalculation there! You are right indeed, I mixed up a line, and have corrected it. As you can see, it does not change anything to any significant degree, and I would suggest that the SBA data that follows those remarks would likely help you. It remains true that according to the SBA, 71% of wages are paid by 5% of the highest income small business. It is not unreasonable to extrapolate that to 50% and 3% (if not even smaller). Whether Romney’s exact 3% claim is precisely true, the inescapable fact is that a tiny fraction of what are considered small business create a large portion of the jobs in the US. It is a two way street, if taxing only 3% of small businesses more was as insignificant as Obama makes it sound, he wouldn’t bother taxing them at all! Thus, he could say he raises taxes on no small business. The fact is his tax increase IS very significant indeed because it is able to tax the bulk of small business income, though he can continue to claim he wishes to tax a small minority of small businesses. That is why it is a lot of money for him, and why it is a big part of his tax plan. Three percent is not really three percent. That is an excellent point, but that is an issue inherent in the questions debated between the two candidates. The problem is that the campaigns agreed that the Obama tax rate would affect only the 3% of small businesses, hence Obama’s claim that it would not affect 97% of them. Romney claims that this will be targeting the job creators disproportionately. However, the JCT who calculated this estimate, actually said something slightly different. It said that only 3% of the individual business tax payers (not those paying corporate) would be affected. To note however, it also said that it would be raising taxes on 50% of the 1 trillion dollars of aggregate taxable income by small businesses paying taxes as individuals. Here we see evidence of the pattern, 3% of the taxpayers in this category are creating 50% of the income that is in fact taxable. Numbers distinguishing small businesses by type of taxation (especially because LLCs and S-Corps can elect to be taxed different ways), income and number of employees are difficult to come by. So, putting aside the exact language of the JCT (though noting the 50% of revenue claim), I focused on the campaign’s claims, which did not make that distinction. Both Obama and Romney simply spoke of the “top 3% of small business”. The article even notes that we are not sure that means top earners or largest in size in terms of employment. Therefore, as I concluded, we cannot easily confirm Romney’s 3% claim precisely, but can most definitely give support to the general idea. It is clear that a very small percent of small businesses create a very large amount of the jobs in the US. Whether you look at the top few in size (# of employees) or top earners, the result is the same. One can assume that there are companies taxed at the corporate rate and at the individual rate at all levels of the ladder, though not necessarily in the same proportion. Obviously, the lower end will have many more businesses paying the individual rate (the hair dressers and translators, etc) than the higher end. This is why it is possible to end up with 97% of individual rate-paying entities not affected by the plan, and hence Romney’s point that this is misleading since they (most) do not employ anyone anyways. So unless the top 5% of small business, in the very vast majority pay corporate tax rates and not pass through rates, Romney’s point holds true in at least general terms (the ball park range). I am inclined to think this is so since the JCT points out the large amount of money that will be taxed. If taxing these 3% more money was so insignificant, it would not even be part of Obama’s plan. Instead it is an economically and politically targeted tax increase that can be explained as very small (only the top 3%) while in fact being very large in terms of the piece of the pie so it will in fact raise a lot of revenue. It will also just as Romney explained, raise taxes on the very job creators the US should be trying to encourage instead of punish. The situation necessary to make Romney’s point incorrect even within a reasonable range would be that the top 3% of small businesses not be in the top small business category in general (that they all be corporate rate businesses), but still create half of all individual-rate income (500 billion dollars), and not employee a significant number of people like other large small businesses. Again, they could not be “large” by income or number of employees because then they would make the first premise false (and join the top small businesses in general). Though exact figures are hard to come by, this scenarios is very unlikely to say the least. It is only possible if high income pass through small businesses are made of companies that generate a very large amount of income without hiring anyone, unlike small businesses in general. That for some reason, those that do the hiring at the higher brackets, are all taxed as corporations, and those that are not, do not do any hiring. There is no evidence available to indicate any of this. Especially since small businesses that are taxed at the individual rate can be individuals, sole proprietorships, partnerships, LLPs, LLCs and even S- Corporations. The only thing they cannot be for sure is a C- Corporation. However…. the fact that you raise this point shows some people are more on the ball than both campaigns, and it warrants another look, perhaps there is a way to reconcile that exact 3% of pass through small business to the number of jobs they create. Thanks to the comments provided by Slick, I will make another attempt to disentangle the tricky question of the “top 3%” of small business and the number of people they employ. We really love The Light House! Keep up the good work! To the Light House keeper: You're doing a great job! Hope you will inspire more people.